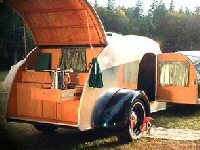 Teardrops n Tiny Travel Trailers • View topic - Teardrop or ProtoStoga trailer . Teardrop or ProtoStoga trailer . Re: Teardrop or ProtoStoga trailer . A plywood bicycle teardrop . Live the adventure , embrace the confusion . " Ray "
I was just getting something out of my garage and saw an old boat I had hanging from the rafters and got thinking that a section of it would make a trailer if I put a top over it and wheels under it . It looks much like this . When I get a chance I will take it down and snap a picture . Now don't think I'm cutting up a lovely old antique this is a boat I built a few years ago on the cheap out of luan flooring . " it works " The thing is just before I got around to painting it I was given a very nice aluminum canoe by my father that I use . So this has been taking up space since then . Now I have an excuse to get in down and try re-proposing it . Give it a new life as something other then a place to throw tents and sleeping bags . Thanks for the link Norm . I did check that thread out already . His bike houses are pretty amazing . I've got a million things to do this weekend , but high on the list is clean up Studio Thirteen " the shop " so I can mess about with my recycled parts to see how they all might fit together . I figure I have parts for at least two more trailers so I can build that many . The next one is probably going to incorporate part of the boat and a equal amount of foam . Well maybe more foam then boat and some 20" Worksman bicycle wheels . I hope to take some pictures of some of my crazy ideas tomorrow so I can share them . Well I hope I finally got the pictures added . Anyway I'm adding some pictures of the full size cardboard cut outs I made of some of my design ideas . I don't think I'm going to use them even though I like them . When I was laying them out all I could think of was how huge they were . But seeing them outside with the full size wheel makes me realize they are still a reasonable size . I know these look huge , but Sakuholma's camper really isn't that large . It is far bigger then a tent , the bicycle campers standby but ...anyway here are more pictures of his designs . As you can see it doesn't use stress skin construction or a box beam design . It's a unibody design . More of Sakuholma's camper designs . I don't think he's built these . A prairie schooner style folder . for him were among those that were lost. He says 45 lbs " 20 kilos " . Here he is on Flickr http://www.flickr.com/photos/saholm/ I believe he's an engineer when he's not building cool bike stuff . I need some help , ideas . I have some of those blue plastic barrels made from (HDPE) High Density polyethylene Plastic . I was thinking they would make a good roof for a vardo style bicycle trailer . A friend was kind enough to give me them free . Now the problem they are about 36" long/high and I would need to fasten them end to end and then put a cover on them so they don't look like ugly blue barrels . While these barrels a tough the problem is HDPE is used to store all kinds of stuff from those milk jugs in the fridge to nasty chemicals ... including ... thats right glue . That includes our favorites like TitebondII & III and even Gorilla Glue . So anyone have ideas ? I was going to put down an idea I had but I want to hear your ideas first . I would like anyone's thoughts that includes any other newbies too . Vardo contradicts the aero design requirement. Light weight and aero seem to be predominant requirements for bicycle trailers. Just because a thing is cheap and available does not make it a good choice. Turn them into keg coolers and invite your friends over to help with your build. Now if you were to happen onto a couple of fiber drums and wanted to build a bike size version of the Foamstream, I'd say, "go for it". Heavy paper/chip board like product. Some have a water "proof" coating sprayed on the inside. Good points KCStudly , I have been thinking about the problems with the plastic barrels more . The problems of no gluing and they are fairly heavy for what they are . I was mostly thinking they would have good protection against something being dropped on them . I also looked at various hollow core doors at the Restore Store really that's what Habitat for humanity calls their thrift store . I was thinking of just using a door for the floor of my trailer and most/all seem heavier then what I can make myself . Is this something like what you are thinking of? Droid , I'm looking at that general shape , but with a top built up from some recycled foam I have . So it would be rigid and then covered by glued down and painted cloth . At least that's this weeks idea . I need to take some pictures of my sketches so I can get more feed back . I like the nice dogs that would be fun on the trip . Where did you find the picture of the one hooked to the bicycle ? I would like to get more info on that one .